The population of Thailand is around 70 million people. I think most of them were at the opening night of the new Central Floresta yesterday. As far as openings go this must have put a smile on the Central owners and management involved in bringing this new shopping experience to fruition – it was a triumph in every respect. If you were driving past over the weekend you must have thought, as I did, that there was no way the new shining light of the Central Pattana Group was possibly going to be ready. Little did we know that the hard work was all happening behind the facade and once the scaffolding came down on Sunday, voila, there it was. Phuket now has a (sorry, I’m going to use the hackneyed phrase) world class shopping precinct in the heart of the island. A ‘central’ retail district to rival anything else in Thailand, outside Bangkok. 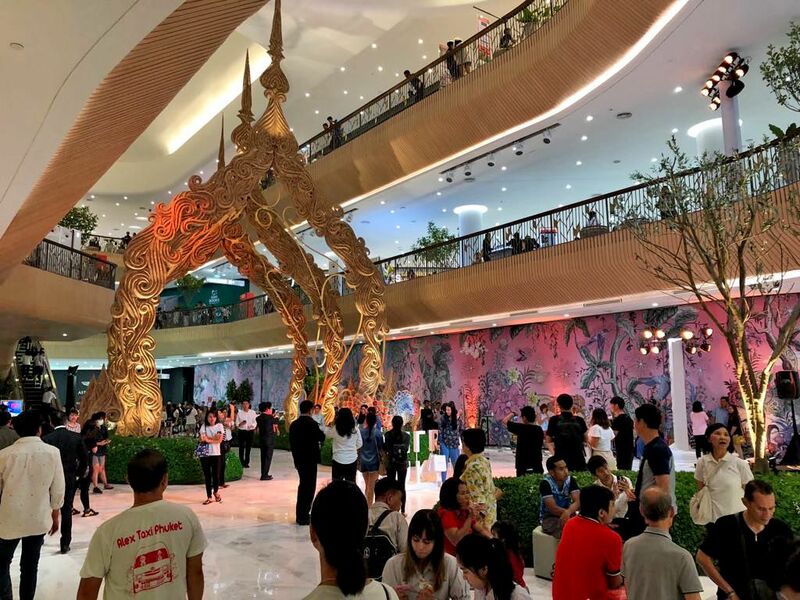 Surely the intersection will now continue to attract more investment and the area will evolve into the island’s premier shopping zone – clearly this is the plan and what Central Pattana are hoping for. Everything about the new Central Floresta is well above predictions – from the parking (there’s plenty), the range of stores, the excellent food court, the imaginative design, the decor, lighting – it’s all outstanding. Particularly pleasing is the integration, just about everywhere you look, of ‘Thainess’ but with a Phuket flavour. The Peranakan architectural motifs adorn the food court, the lofty statues and sculptures are highly imaginative and add spectacle to the open spaces. Whilst some of the better-known luxury brands are missing at the moment there are still plenty of high-end luxury brands and a few new ones as well. I am sure we will be calling the two sides of the road ‘the old Central’ and ‘the new Central’ in the short-term, but can imagine there will be a time when the two will morph into one precinct we’ll simply call ‘Central’. Phuket went a few notches up the retail ladder yesterday when the new store opened its doors. Apart from Thailand’s best beaches, the island can now boast an international shopping precinct as a key attraction – it was lacking in the past with Patong’s Jungceylon looking tired and Central Festival in need of a modern interpretation. The retail scene is changing a lot faster than developers seem to be able to cope with. For the ‘locals’ who yearn for the Phuket of old – the little Thai tropical paradise with the cheap bars and tacky beach restaurants – it’s long gone and it’s not coming back. Thailand’s largest companies and biggest investors are spending big and the biggest international brands keep coming, investing in new projects, raising the stakes and the quality of the island’s offerings. In the next few years we have the opening of one of the most spectacular water theme parks in Asia opening up (Blue Tree in Cherng Talay), a classy new Mandarin Hotel at Laem Singh on the west coast, the opening of the MontAzure properties at Kamala and a list of other new developments currently pending announcement – all taking Phuket up a notch. Phuket will never be the same; it’s growing and evolving into an urban island for tourists – the ‘Hawaii of South East Asia’ (as I heard someone describe it last night – thanks Harry). If you really want to live the 1990’s Phuket you can still find a similar lifestyle north of the island, down around Trang, parts of Krabi or even up around the northern parts of Phuket. But the island is now on a one-way trajectory to become Thailand’s most recognised international brand. So congratulations Central Pattana for having the vision and coming up with something we can all enjoy and that tourists will appreciate. Floresta is a welcome addition and will surely encourage other shopping zones on the island to invest and catch up, otherwise be left behind. But wait, there’s more coming. The new shopping precinct has three themed attractions to open yet and an enormous Aquarium as well. Check out Floresta but leave yourself a morning or afternoon – there’s plenty to absorb. This article appeared in The Thaiger.